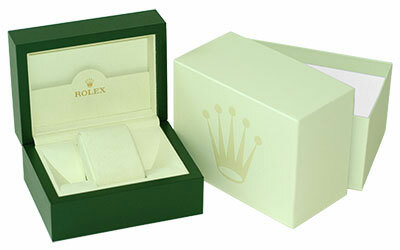 Contemporary design featuring green leather box with suede interior, watch holder, and Rolex embossed cardboard outer box. Works for both Mens and Ladies Rolex watches. Green leather box with suede interior, watch holder, and jewelry compartments. Approximately 11 inches wide. Usually sold with very expensive timepieces.